In 1992 John Malcolm McCardell Jr. was named the fifteenth president of Middlebury. Born in Frederick, Maryland, in 1949, he attended Washington and Lee University and graduated Phi Beta Kappa in 1971. From 1971 to 1977, he served as a sergeant in the Army Reserves, and from 1972 to 1973, he did postgraduate work at Johns Hopkins University before entering the doctoral program in American history at Harvard. He joined Middlebury’s history faculty in 1976 and also married Bonnie Greenwald, with whom he has two sons. He served in administrative capacities along with teaching, acting as dean for academic development (1985 to 1989); dean of faculty (1988 to 1989); provost and vice president for academic affairs (1989 to 1991). 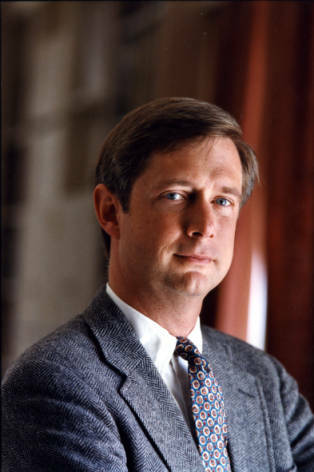 After the resignation of President Timothy Light, he became acting president in September 1991. Seven months later, the trustees appointed him president–the second, after Ezra Brainerd, to be named from the ranks of the faculty. At this time, the college was suffering from the national recession and from years of demoralization after Light’s year-long presidency, which had been beset with bad decisions. As well, student life had become complicated with its aging fraternity system and campus-wide problems with alcohol, along with the elusive goal of diversity among the student body and faculty. The faculty was also discontent over salary and work issues and over fraying relations between town and college. McCardell capitalized on the community’s desire for reconciliation and forward movement. His decisions were also aided by a dramatic national recovery and expert endowment investment advice from trustees, which spurred a major transformation. Construction of campus buildings took place on a new scale. In 1992, the Center for the Arts opened, followed closely by the Youngman football and lacrosse field, the Olympic-sized swimming and diving center, the Natatorium, and finally the 2,200-seat Kenyon Ice Arena. However, the most transformative facilities change was building of Bicentennial Hall, a 190,000 square-foot, four-story stone edifice, which opened in 1999. Also in 1999, plans were announced to transform Starr Library, erecting a three-story stone structure around it. Any catalogue of Middlebury expansions during the McCardell administration would also have to include establishment of the Center for Educational Technology, a program to incorporate technology in language instruction; the incorporation of the Geonomics Institute into Middlebury College to aid enlargement of the international studies program; and expansion of the summer language schools, including the addition of the School of English program at Juneau, Alaska joining those at Bread Loaf, Oxford, and New Mexico. John McCardell presided over a remarkable expansion–combined with an increase in momentum and even a renewal of spirit–as Middlebury turned the corner into its third century.